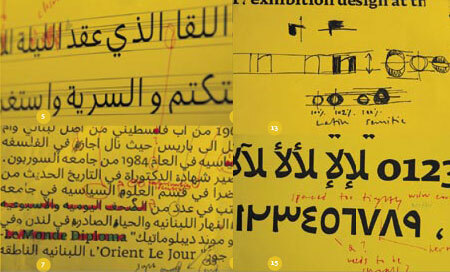 Fedra Arabic: The Typographic Matchmaking experience. Last year, I have been involved in the Typographic Matchmaking project initiated by the Khtt foundation. The idea behind the project was innovative and aimed at developing new modern Arabic typefaces that respond to the market need, that work in harmony with Latin typography, and that solves many of the current stylistic problematic issues with many of the current available arabic typefaces around. As a designer primarily involved in my design studio- Tarek Atrissi Design (www.atrissi.com)- on developing a modern Typo.Graphic language, I was interested in being part of this process. The project started by defining fives teams, each team consisting of two designers: One renowned Dutch Designer; and one Arabic Type Designer / Designer / Calligrapher- with strong interest and practice in Type Design. 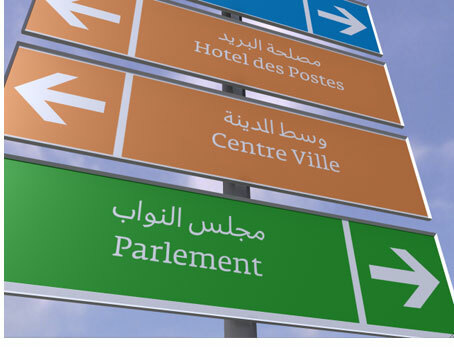 Each team’s goal was to create an Arabic font that matches one existing Dutch font developed by the Dutch Type designer of the team, and to aim at making the arabic font works in harmony with its latin counterpart, so it becomes a resource for bilingual communication, while keeping the essence of the Arabic script, yet stressing on a modern typographic expression. I was teamed up to work with Peter Bilak, founder of Typotheque in Den Haag, The Netherlands, whose fonts include the famous Eureka and Fedra type families. The intriguing common point between us both as designers, is the fact that we are both foreign designer that have established ourself in the Netherlands- which added another layer to the multi-cultural aspect of the project. I learned the most from collaborating with Peter, and following closely how he approached this project, on all levels (conceptual, design and technical aspects). The project seemed from the start very interesting: It targets on many levels some of the main issues and problems of Arabic Type Today. On one hand, it promises with a result a set of new arabic typefaces, which would be due to the collaborative nature of the project different that what is available. 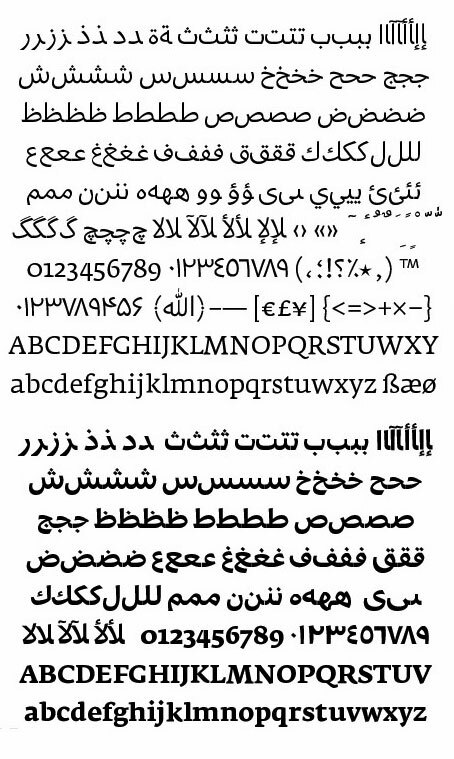 So adding a variety of new Arabic fonts, within the very limited typefaces available in the market today, seemed great. 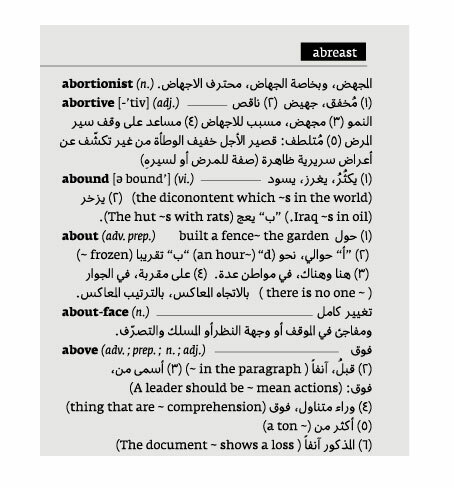 On the other hand, the project addresses the critical issue of Latin / Arabic Script adaptation, very important across the bilingual Arab world. 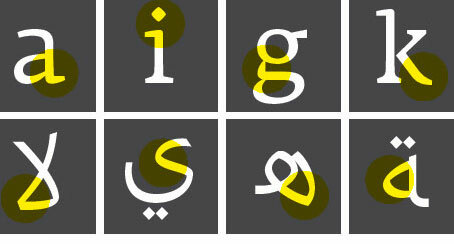 It also focuses on developing Arabic Text fonts, which would work in small sizes. As a graphic and type Designer primarily focused on creating a contemporary Arabic Typo.Graphic Design Language, my personal interest in this project was based on the experimental yet practical aspect of it. Collaborating with a renowned Dutch Designer was where I thought I could benefit most from, and seeing and experiencing a different approach to Designing an Arabic Typeface, that would probably affect in the future my personal approach in Arabic Type Design. On the other hand, it was very interesting to see how the same project was handled by other teams, and seeing the different results. That in itself was a learning experience in following the process and experience of the rest. Sample application as a text font in a dictionary bilingual page, using the font is small sizes. The outcome of this collaboration and a one year long working process was Fedra Arabic. I include sample applications here, showing the font in usage in different context. Fedra Arabic has a friendly aspect to it and has a contemporary look that many designers look for when working with an Arabic project and are looking for a fresh different font. One of its main characteristics is that it is Legible in small sizes and work very well as a text font. It is as well a font that is not limited to being used in small sizes and could work nicely on a variety of different type of usage, as shown in the applications, in Titles, Signage, and branding. The most interesting part in the project was the process in developing the font, and the early phases of research and experimentation. The first step in the research was to look at examples of Arabic handwritten text. Samples of common contemporary Arabic fast handwriting from different parts of the Middle East were collected. Those samples show a surprising variety of readable and generally accepted forms (per letter), in addition to different cultural preferences. The second step of the research was to get a better understanding of the differences between the Arabic and Latin scripts, and analysing the difference in comparis the handwritten arabic and latin text to simplified Naskh-style Arabic and a Latin serif typeface. We created as a first step the basic simplified skeletal shapes and proportions for the Arabic characters- which was the basis of designing the letters using the formal attributes of Fedra; tension of curves, contrast, weight, etc.. and the start of a long process of back and fourth work between the two team designers. 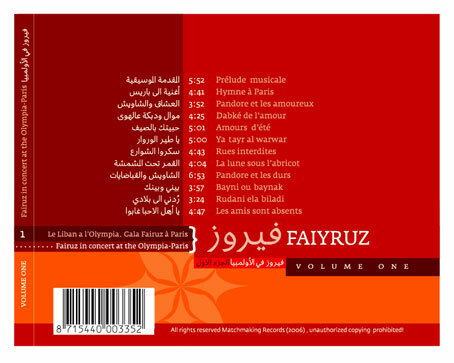 The Design concept of Fedra was to balance legibility with simplicity: the idea was to create an original Arabic typeface that is not directly based on the calligraphic traditions, but one that takes into consideration the contemporary uses of Arabic type, in addition to be a solution in itself to dual script typesetting. Fedra’s simplified forms are stripped from all decoration while keeping the intrinsic structure of the Arabic writing system. It combines the simplicity of written letterfoms with the more traditionally used forms of printed book type. It was designed to work both with Fedra Serif and Fedra sans. The design characteristics of Fedra Arabic were to a big extent following the proportion of the Latin font- the baseline, ascender and descender were kept identical, while the x-height was redefined into two middle heights. No shapes were directly brought from the latin font, but the character of the curves was adopted when designing the Arabic characters. Fedra Arabic, and the entire process of the project, as well as the beta version of all 5 fonts developed by the 5 teams, will be featured in the book “Typographic Matchmaking” by Huda Abifares, to be launched in August 2007.